Not sure how this depicts The Hermit? Click here. Etteilla: Traitor, Treason, Hypocrisy, Trickery, Impostor, Anchorite, Clever, Hidden. Lévi: The true name of The Hermit is Prudence, and he thus completes the four cardinal virtues. 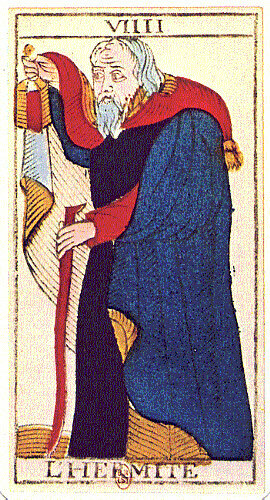 Illustration (right): The Hermit from Tarot de Marseille by Nicolas Conver (1761), re-published by Héron. Click on the image for a larger one. Christian: This old man personifies experience acquired in the labours of life. The stick symbolises the support given by prudence to the man who does not reveal his purpose. Prudence is the armour of the Wise. Circumspection allows him to avoid reefs or pitfalls and to be forewarned of treachery. Papus: Experience, won in the labour of life, has rendered the Hermit a prudent old man, and prudence united to wisdom will safely lead him to the higher level which he is anxious to attain. Felkin: The Hermit, or Prudence, is the eternal seeker, the Pilgrim soul. Wirth: The light which the Hermit has at his disposal is not limited to throwing light upon the surface: it penetrates, searches out and reveals the inner quality of things. In order to recognize a true man Diogenes had to use a lantern similar to the Hermits. Case: The Hermit, this Ancient One, stands in darkness, because what is behind our personifications of the Supreme Reality is darkly incomprehensible to our intellects. Yet he himself carries his own light, and holds it aloft for the benfit of those who toil upward toward him. Sadhu: It is hard to live under the protection of the god of the materialists, called accident or chance, if we do not know the means of the theory of probability very well, which, in different phases of life, dictates various degrees of circumspection to us. So another name for this card will be prudentiacarefulness. Gray: Silent council, wisdom from above, prudence. A meeting with one who will guide the seeker on the path to material or spiritual goals. Attainment. Possible journey. ONeill: The Hermit is a religious ascetic. Such a symbol would have appealed to the Renaissance designer both from his own Christian tradition and from the pessimistic Gnosis. 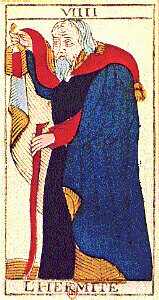 The Hermit also represents temporary isolation and introspection. This period of isolation was a common preparation for initiation in the Mystery Religions. Pollack: Primarily, the card means a withdrawal from the outer world for the purpose of activating the unconscious mind, but the Hermit also signifies a teacher who will show us how to begin this process, and will help us find our way. 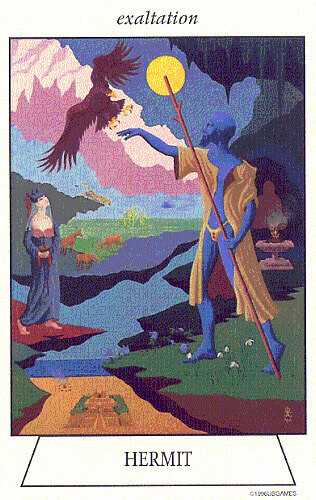 Turk: The Hermit represents an exaltation which seems to separate you from your familiar world. It is a moment of hushed expectancy during which your energy soars to a peak of bliss which is all too brief. Illustration (right): The Hermit from Navigators Tarot of the Mystic Sea by Julia A. Turk (copyright &COPY; 1996 U.S. Games Systems). Click the image for a larger one. Symbol (top): It is best viewed sideways and depicts a lantern, which often comprises, in part, this Arcanum.